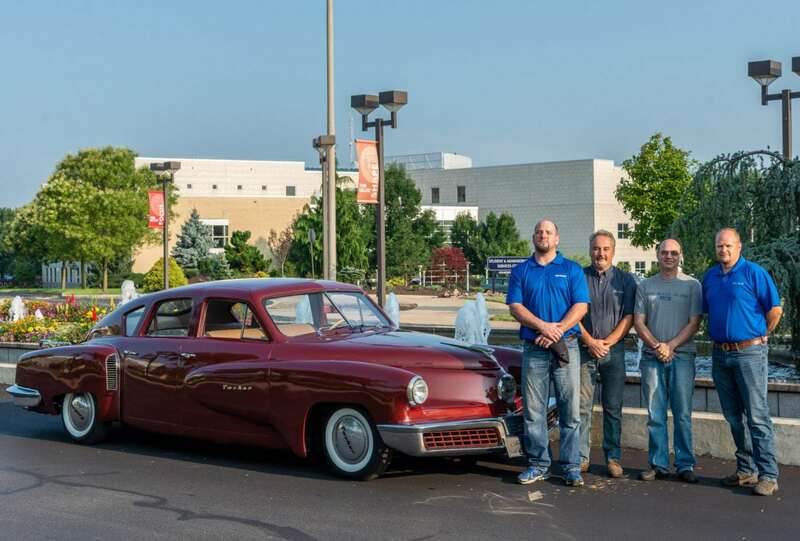 PHOTO PROVIDED Some members of Penn College’s Tucker restoration team gather at the college’s main entrance for the vehicle’s celebratory sendoff to California. From left are student Erik W. Weigle, of Linden; and faculty members Roy H. Klinger, Christopher H. Van Stavoren and Robert K. Vlacich. The team preserved the 1947 Tucker prototype, nicknamed the “Tin Goose,” which is on loan from the William E. Swigart Jr. Automobile Museum in Huntingdon and archived at the Library of Congress. The college’s contribution will be included in a “parade of Tuckers” at Pebble Beach, honoring this 70th anniversary year for the vehicle’s official production. The event’s media office said there is an established history of colleges entering cars in the Concours, but it is unique that the Penn College students who worked on the Tucker will display their work in person. The “Tin Goose” is entered for exhibition and will be eligible only for special consideration, a spokesperson said, and not for class awards or Best of Show. The students involved in the eight-month project delineated the tasks, from electrical work to suspension and brakes, and played to one another’s strengths in accomplishing them. Desforge is also the group’s designated photographer and ­­ to document the experience and provide a reference for any follow-up work.